As the alleged electoral fraud heat continues, bloggers and netizens, are now more eager to know the truth behind the controversies surrounding Comelec and Smartmatic. 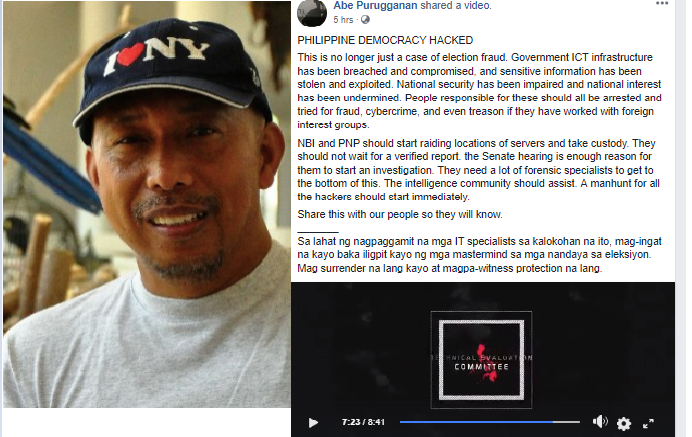 In a Facebook post of a former military officer Abraham “Abe” Purugganan is a message to the Filipino people that what happened is no longer just a case of election fraud but a case of ‘democracy hacking’, undermining the national interest. Purugganan’s message seems to have rooted from a video titled “Philippine Democracy Hacked” that has been circulating in social media recently. After a quick research, the video was traced back in 2017, posted by a website named Philippine Computer Society, and was also uploaded in youtube by username ELECTORAL PROTEST PH. The military retiree also warned the IT specialist who created the video to be careful, as the people behind the alleged election fraud might go after them. This is no longer just a case of election fraud. Government ICT infrastructure has been breached and compromised, and sensitive information has been stolen and exploited. National security has been impaired and national interest has been undermined. People responsible for these should all be arrested and tried for fraud, cybercrime, and even treason if they have worked with foreign interest groups. NBI and PNP should start raiding locations of servers and take custody. They should not wait for a verified report. the Senate hearing is enough reason for them to start an investigation. They need a lot of forensic specialists to get to the bottom of this. The intelligence community should assist. A manhunt for all the hackers should start immediately. Share this with our people so they will know. Sa lahat ng nagpaggamit na mga IT specialists sa kalokohan na ito, mag-ingat na kayo baka iligpit kayo ng mga mastermind sa mga nandaya sa eleksiyon. Mag surrender na lang kayo at magpa-witness protection na lang. After polling precincts declared in May 9, 2016, winners from all government posts, from Governors down to City Councilors were already known. By the morning of May 10, Presidential candidate returns were already announced, and some already conceded their race to their unofficial winner. Drama begins to unfold and unbeknown to the Filipino people. It was over, before it even started. This was confirmed by the political parties took up the PPCRV quick count center. Electoral results resumed briefly by around 8:00 PM. by the morning of May 10, 2016. Supporters of VP Candidate Bongbong Marcos decried what it seemed to be foul setting that happened that evening. The election results the Filipino people were seeing in TV, and hearing in radio that fateful day actually came from a computer dubbed the Transparency Server. It stops on the mix of data in the PPCRV Headquarters along U.N. Avenue, Manila. The transparency servers and computers were not subjected to any form, of review or audit. This contravenes expressed in the virtue of RA9369, otherwise known as the Automated Election Law. No one really knows how the server works. Stays for only known 2 parties, the COMELEC and Smartmatic. Smartmatic is the only vendor of COMELEC that configures, supplies and maintains all vital components of the AES (Automated Election Systems). Away from the muscle and prying eyes of the usual election conundrum and well hidden from the scrutiny of the public is the known literally data center owned by IP Converge located in Upscale Bonifacio Global City in Taguig. It has the Queue Servers and other Top Secret Servers that determine the Fate of the nation for the next six years. The Queue Server acted as a Check Point and Gateway where all election returns transmitted will be queued before they will be forwarded to their legitimate destinations. Its mere presence is a clear violation of the law. And their secrecy puts more weight to allegations that they were used for undermining the electorate's will. May 8, 2016, the Top Secret Server is booming with an unexplained activity. The servers were working overtime collating data transmitted for some vote counting machines. But May 8 is the day before the opening of the data transmitting centers. Polling precincts are not soon to be open after the next 23 hours. Oddly, these transmissions came only from a set of 9 IP Addresses. One IP Address in particular have more access than the rest. From the pattern of the access, it seems that queries and attempts only came from either a small set of computers or they were using COMELEC assigned USB Data Sticks to transmit from a handful of VCMs in their possession. Either way, the access could not be done by anyone without the knowledge to do so. A Special COMELEC Resolution was issued a few weeks before May 9, to make it easy for these hackers to manipulate the election results. These were done in steps and both Smartmatic and COMELEC were complicit in assuring Philippine Democracy would not prevail. December 2015, COMELEC officials were ordered to upload the Election Project of Precincts, Candidates List, and all other required election data to the Election Management System (EMS). They are unable to do it, and so the task is handed over to Smartmatic. The EMS is the heart of the AES. Anyone has access to it has full control of the election. By January 2016, Smartmatic experts were flown to the Philippines to configure the AES. At its juncture, Smartmatic had full control of all the data and the computers required for the automated elections. From Data preparation and uploading to Ballot Generations, VCM and CCS Configurations, Passwords, and ballot layouts for each polling precinct. The answer lies in COMELEC's new creation, the Regional Hubs. It will be, they, who will be receiving the configuration files to a Secured File Transfer Protocol of SFTP Server, located just a few steps away from the EMS. The regional hubs were authorized to configure contingency VCM and CCS and swap them with the official VCM and CCS come election day. Despite this power granted, no political parties, media nor poll watchdogs were present to witness the activities inside the Regional Hubs. And since the swapping happens when a VCM malfunctions then the swap becomes legitimate. Cheating is seamless. There are traces of a dark history between the Smartmatic and COMELEC. One that is involves a tapestry of unsettling and unmotivated events. And the country's automated election history, Smartmatic failed to get the Technical Evaluation Committee Certification within 90 days prior to the election. Yet, the issue was shrugged off by COMELEC. The International Certification Entity SLI, tasked the COMELEC to audit the Smartmatic AES gave an explicit comment that the rest of infrastructures also be audited and reviewed. But these were placed as a footnote and were ignored by COMELEC altogether and as a result, while the EMS, CCS, VCM underwent a public source code review. All other components including the Central Servers, the Transparency Servers, Queue Servers, and the entire result transmission service were not subjected to a source code review nor the Infrastructure Audit. It is the hacker's job to infiltrate, plan a virus to cripple the system and exposing their bare plans undetected. Clearly, the Philippine Democracy was hacked.